Description About The Author:- Krishan Saigal, 70 a gold medalist in engineering, M.P.A. from Harvard University and a Ph.D. in Public Administration entered the Indian Administrative Service in 1954. He has done various senior assignments in the field, the State headquarters and the central secretarial and rose to the level of Chief Secretary, Assam. For the last 10 years he has been working in international orgnizatins and lecturing on how to manage high-tech. he has several published articles on planning, rural development, defence, international relations, sustainable development, Gandhian philosophy and economics. He is also the author of a book policy making in India.Contents:- Preface â¢ Introduction â¢The Vedic System â¢ The Psychological Approach of the Upanishads â¢ Dharmic Management: Vedic Society â¢ Dharmic Management: The Art of Governance â¢ The Yogic Management of the Bhagavad Gita â¢ Gandhian Management â¢ Conclusion â¢ Index.About The Book:- There Has Always Been An Inherent Tension In The Vedic System Between The Negative Affirmative Approaches, Between Life In The World And Renunciation. The Book Explores The Manner In Which Dharma And Yoga Harmonize The Tensing Between The Inner And The Outward. The Book Goes On Explain How Vedic Management, Through The Concepts Of Dharma And Yoga, Encourage Peace And Concord Through Selflessness And Cooperative Behavior And The Sacrifice Of The Ego, Opinions And Strongly Held Beliefs So As To Harmonize With Fellow Human Beings. The Upanishad System Which Interiorize Vedic Through The Yogic Way Of Meditation And Contemplation Is Also Examined. The Book Goes On The To Delineate The Concept Of Dharmic Management As Applied To Social Concerns And The Polity. This Is Through An Examination Of The Dhramashastras And The Two Epics, The Ramayana And The Mahabharata. The Yogic System As Elaborated By Lord Sri Krishna In The Bhagavad Gita Is Studied To See Its Impact On Managements. The Conclusion Reached Is That Lord Sri Krishan Makes Management More An Art Than A Science While Also Making The System Flexible And Creative. The Normative Vedic Management System Was Utilized By Gandhi To Set Up An Organization That Toppled One Of The Mightiest Empires Known To History. The Manner In Which This Was Done Is Also Examined. 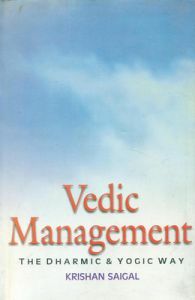 Some Reference Form The Latest Management LittÃ©rateur Are Also There And It Is Left To The Reader To Decide Whether Vedic Management Is Relevant Today., About The Author:- Krishan Saigal, 70 A Gold Medalist In Engineering, M.P.A. From Harvard University And A Ph.D. In Public Administration Entered The Indian Administrative Service In 1954. He Has Done Various Senior Assignments In The Field, The State Headquarters And The Central Secretarial And Rose To The Level Of Chief Secretary, Assam. For The Last 10 Years He Has Been Working In International Orgnizatins And Lecturing On How To Manage High-Tech. He Has Several Published Articles On Planning, Rural Development, Defence, International Relations, Sustainable Development, Gandhian Philosophy And Economics. He Is Also The Author Of A Book Policy Making In India., Content:- Preface â¢ Introduction â¢The Vedic System â¢ The Psychological Approach Of The Upanishads â¢ Dharmic Management: Vedic Society â¢ Dharmic Management: The Art Of Governance â¢ The Yogic Management Of The Bhagavad Gita â¢ Gandhian Management â¢ Conclusion â¢ Index.